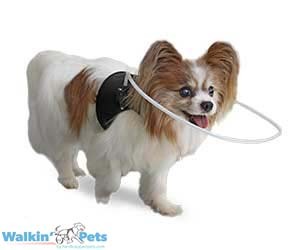 Lightweight, flexible halo for blind dogs comes attached to comfortable harness/vest. The Blind Dog Halo allows poorly or no sighted dogs to better navigate whatever spaces they are in. The halo will bump into furniture, other dogs, or walls before your dog does! This product helps to build confidence while allowing dog to participate in normal activities. Halo is lightweight and flexible. Video - See how the Blind Dog Halo works!